The term "Shaivite" is overused nowadays. For instance, Iyer Brahmins are often called Shaivites, but they're actually followers of Adi Shankaracharya's Smartha sect (which I discuss here and here), and simply adopt Shiva as their Ishta Devata. True philosophical Shaivism is relatively rare nowadays (in contrast to philosophical Vaishnavism which is pretty common). I discussed one genuine Shaivite sect, the Lingayat sect of Basava, in my answer here. But my question is related to a more famous sect of Shaivism, known as Shaiva Siddhanta. Just as the Sri Vaishnava sect (of which I'm a member) is based on the Pancharatra Agamas and the poems of the Alwars, the Shaiva Siddhanta sect is based on the Shaiva Agamas and the poems of the Nayanars. Now the reason why it's called Shaiva Siddhanta is because of the Nyaya school's terminology of Purvapaksha and Siddhanta. In any argument the Purvapaksha is the opponent's position, and the Siddhanta is the final conclusion that refutes the Purvapaksha position. The Shaiva Siddhanta sect considers all other schools of philosophy to be Purvapaksha positions, and considers itself to be the ultimate Siddhanta which refutes all of them. In that context, it classifies philosophical schools into different categories according to how closely they agree with Shaiva Siddhanta. As described in this excerpt from K. Sivaraman's book Shaivism in Philosophical Perspective, the categories are the outermost group, the outer group, the inner-outer group, and the inner group. The schools with which Shaiva Siddhanta has closest affinity are six in number - Pashanavada, Bhedavada, Shivasamavada, Shivasankrantavada, Avikaravada, Nimittokarana-Parinamavada (Shivadvaita). Now the last one is recognizable; I think it refers to the Shivadvaita philosophy of Srikantha Sivacharya, who subscribed to the Vedanta school in contrast to most Shaiva Siddhantins who reject Vedanta. But my question is, what are the other five Shaivite sects listed in the inner group of Shaiva Siddhanta? Sometimes a Shuddhashaiva-vada is added to the list and the first two, namely pashana-vada and bheda-vada, identified bringing the total again to six. Mapadiam p. 44 (Cf. 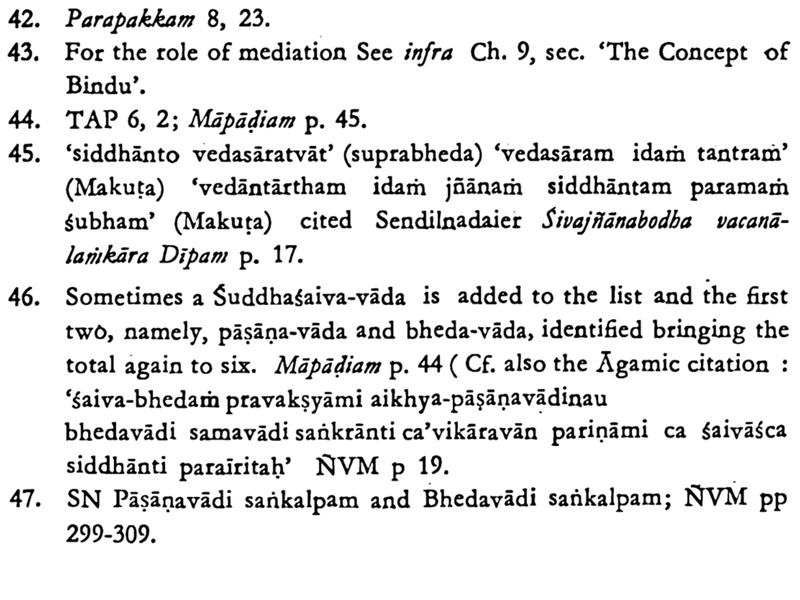 also the Agamic citation: "shaivabhedam pravakshyami, aikyapashanavadinau bhedavadi samavadi sankranti cha'vikaravan parinami cha shaivascha siddhanti parairitah"
But does anyone know any details about these sects, like who founded them, what do they believe, and which of them if any still exist? Browse other questions tagged philosophy shaivism sects agamas shaiva-siddhanta .